AWA produces videos and documentary shorts focused on the foundation's restoration projects. Take a peek. Watch AWA’s videos because ”moving pictures” are worth a thousand words. AWA is committed to documenting all of our projects by producing videos and full-scale art documentaries that help spread the word about restoration and exhibition of art by women. The Foundation is often featured in news reportages or at the center of filmed interviews. This selection of video shorts will help art-lovers get a sense of the work we do, and the philosophy behind it. If you have not yet visited the Uffizi exhibition called ‘Female Perspectives: Women of Talent and Commitment’, this trailer by LDM TV will give you a glimpse of the show, open until May 26, 2019. 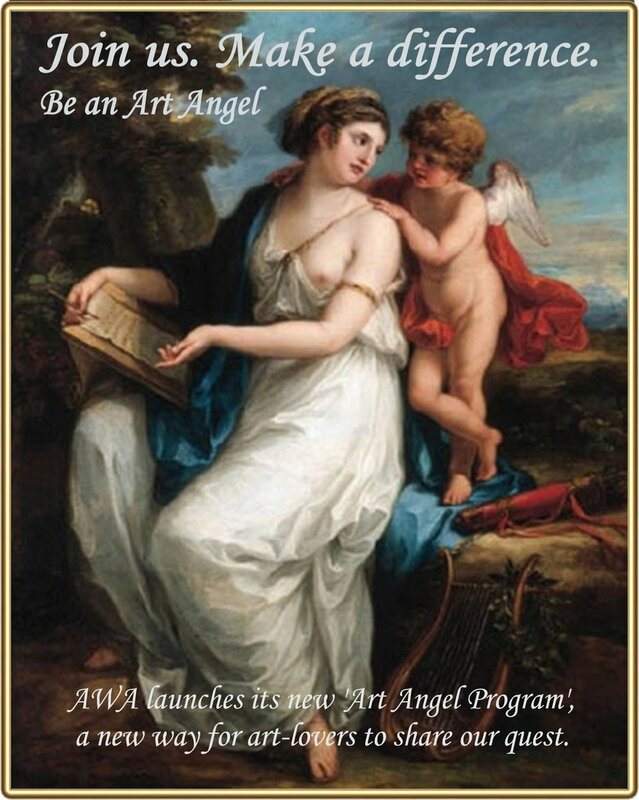 See why we say that AWA is ‘Uffizi ready’? Have a look at 'Female Perspectives: Women of Talent and Committment', the Spring exhibition, organized in collaboration with the Uffizi Galleries and AWA. The show will run at the Gallery of Modern Art in the Pitti Palace until May 26, 2019. This news feature, broadcast on ToscanaTV, shows how its paintings are windows onto the world of women artists and how professional women at the turn of the last century are depicted by their male counterparts. “It is a is a declaration of love for the arts,” says German news program Heute+ about the documentary, 'THE ART OF MUSEUMS', premiering early February. Its Florence episode features AWA in the conservation studio and some of our best-loved work at the Uffizi. There is nothing like holiday cheer and a year’s worth of work to make the season bright. We may have captured you on film in 2018 during our quest to restore and exhibit art by women. A 360-degree journey of Florence scenes and friendly faces… an ode to historic women artists and those who love them. ‘Women Artists: Florence, 1900-1950’ features the recent restoration of art by women from Florence’s Gabinetto Vieusseux and the Uffizi Galleries. It spotlights artists Leonetta Cecchi and Fillide Levasti who carved out a ‘space of their own’ in a Europe torn by war. With Monica Carovani. The unveiling of Plautilla Nelli’s lunette, The Crucifixion at the Last Supper Museum of Andrea del Sarto. Now on public view: a rare sixteenth-century devotional work based on the (female) commissions spiritual visions. In this video… visions of modern-day happiness thanks to one more painting salved from oblivion. The twentieth-century art of Bolognese painter Lea Colliva is welcomed to Florence for her Villa Il Palmerino exhibition 'Pathway of the gods'. This Expressionist artist with a love for experimentalism inspires modern-day women on a journey from the archive and atelier… into the museum spotlight. Executive producer and show host Kathy McCabe takes us to see a side of Italy that sparkles in her PBS documentary 'Dream of Italy' (broadcast January 2018). During her Florence episode, she comes to see the city's first female artist, thanks to AWA's restoration of Nelli's Last Supper. Shot at the height of summer, the footage is a light-filled example of 'our' in-progress painting! It truly is Nelli like you've never seen her. In 2017, rather than sending its traditional ‘Christmas card’, AWA decided to produce a restoration video that truly shares the Christmas spirit. The conservation and exhibition of Plautilla Nelli’s ‘Annunciation’ is a Christmas gift to the City of Florence and art lovers everywhere. Find out what Christmas and restoration have in common! Five hundred years of creative talent captured in a single fragrance: ‘Invisible’. Crafted exclusively for AWA by Aquaflor Firenze, an artisanal perfumery in the Santa Croce District, ‘Invisible’ was born from Florence’s age-old tradition in perfume-making, a sensuous art supported by the Medici Clan. Its scent is an intriguing combination of violets and musk, with surprising notes of varnish and tobacco. The rare Indian flower osmanthus makes for a fragrance in honor of women artists that history must never forget. The perfume’s name, reminiscent of Jane Fortune’s book ‘Invisible Women’, tributes the many female painters and sculptors whose works will be salvaged and exhibited thanks to the Advancing Women Artists Foundation’s mission. This video offers an exclusive peek at the Aquaflor laboratories and its ‘perfume diffusion ceremony’, the Florentine celebration that first launched the ‘Invisible’ into the world. Video by Bunker Film. Ten years with AWA. An extraordinary journey that answers the question: Who were Florence's women artists? How can we protect their works and share them with the art-loving public. An up-close adventure to rediscover the hidden side of Florence's art treasures... by women. This trek takes viewers through some of Florence's most exquiste museums and churches, like the Uffizi Galleries, the Museum of San Salvi, the San Marco Museum, Santa Maria del Carmine, Santa Croce and more. For AWA, one decade means four dozen restoration projects completed. Video by Bunker Film. Footage generously provided by Francesco Cacchiani, Kirsten Hills and Vincenzo Capalbo. The ancient refectory of Santa Maria Novella hosts the launch event of ‘TheFirstLast’, AWA’s crowdfunding project to restore Plautilla Nelli’s Last Supper. An evening of magic in the venue that will host the masterwork in 2018! Special guest speakers: the City of Florence’s Councilor for Equal Opportunity and conservator Rossella Lari. The restoration is being carried out in collaboration with Servizi Musei Civici Fiorentini. Enjoy the evening from afar! The “Fiorino d'Oro”, Florence's highest honor goes to Jane Fortune! The Awards Ceremony was part of the opening event of the Global Mayor's Forum, 'Unity in Diversity', at Florence's Palazzo Vecchio. Have a peek at the evening, thanks to video journalist, Kirsten Hills. An art victim of Florence’s 1966 flood emerges as victor, fifty years after the disaster. Conservators Elizabeth Wicks and Nicoletta Fontani rescue Violante Siries’ masterwork at the Florentine Church of Santa Maria Maddalena de’ Pazzi, whilst researcher Poiret Masse scours Tuscany, recovering the missing pieces of the artist’s forgotten oeuvre. The lives of Adriana Pincherle and Eloisa Pacini tell us volumes about the last century. Artists quietly at the forefront of Florence’s important cultural movements, their respective paintings reflect European trends and sweet local flair. During an interview about Florentine patroness par excellence, Anna Maria Luisa dei Medici, the Medici Dynasty Show asks about ”the initial spark” that led to Advancing Women Artists. A collective Editing Marathon fills the gaps in Wikipedia content on the achievements of women artists. A useful way to commemorate International Women’s Day. AWA’s founder Jane Fortune and actor/comedian Michael Palin enjoyed a ”dual interview” when he came to Florence to film the BBC art documentary on Artemisia Gentileschi. ‘I am in awe of Florence,’ Palin admitted during the interview. We imagine that Artemisia made a fascinating guide! ’The Flood Ladies’ are modern and contemporary artists who hoped their gifts to Florence would contribute to making the city a center of the arts in the twentieth century. Their dream reaches partial fulfillment with the inauguration of Florence’s Museo Novecento. WFYI Productions. Written and produced by Todd Gould. Discovery the "hidden half" of one of the world's most beloved art cities! Florence, Italy, is the birthplace of some of the world's most celebrated artists, scientists, and architects – from Michelangelo and Leonardo to Brunelleschi and Galileo. Yet little is known of the women artists who once painted there. A center for female creativity for more than five centuries, Florence hosts innumerable works by significant women painters from the Renaissance onward. Invisible Women sheds light on these groundbreaking women artists and their virtually unknown works. It also points to the rediscovery and restoration of these works as the guiding forces behind rescuing the art of Florence's forgotten women artists. Based on the book by Jane Fortune. The Indiana Historical Society Announces 2014 Living Legends Award. AWA Founder Jane Fortune and Vice Chair Robert Hesse are official ”Living Legends” thanks to their outstanding contributions to the world of art and culture in all its forms. Irene Parenti Duclos is the eighteenth-century protagonist of this ten-minute video spotlighting the restoration of her Madonna del Sacco, after Andrea del Sarto. The artist proves herself an example of precision and courage. International scholars join forces to recover the legacy of poet and paintress, Irene Parenti Duclos, a pioneer in her time. This conference at Florence’s Accademia Gallery spotlights ground-breaking discoveries. Conservator Nicola Ann Macgregor recounts an unexpected discovery whilst restoring Artemisia’s David and Bathsheba. Have a look for a better understanding of the ”controversial” techniques used. Artemisia spend seven years in Florence and AWA has spent at least that much time working to rediscover her many gifts to the art world. Our David and Bathsheba Project is the fascinating recovery of her little-known masterwork. Santa Maria del Carmine’s ancient cloister hosts Felicie de Fauveau’s Monument to Anne de la Pierre, damaged during the Nazi occupation of Florence in the Second World War. Here’s how AWA restored history.